Tip $1 and get Donate to the music. Every $ counts! Don't forget , I have two FREE albums on my website! desertrose: How did you get into Brazilian music ? Dave Holmes: cosmiccore.bandcamp.com 4 FREE ALBUMS! desertrose bought reward: "Donate to my music. Every $ counts! Don't forget , I have two FREE albums on my website!" desertrose: I have to go now. Thanks for giving me the calm break that I needed. I even danced. karl-o-neill: when you off to Spain Dave or have you already been? RichB: Enjoying your mellow lunchtime vibes Dave. Keep it up! RichB: Born to Bossa Vols 1 and 2. Awesome. Check em out folks! Stefan Valica, Slovakia bought reward: "Donate to my music. Every $ counts! Don't forget , I have two FREE albums on my website!" RichB: Still listening in Dave. You're the perfect accompaniment as I'm decorating the bathroom! RichB: More applause. Don't play anything too fast or I'll get paint all over the place. Aah that's good! cool tunes to start my day! Donate to the music. Every $ counts! Don't forget , I have two FREE albums on my website! My name is Dave Holmes, I broadcast my sets live from the UK here on Concert Window! Performances are made from my home studio and in the near future, whenever and wherever I am playing around the planet. 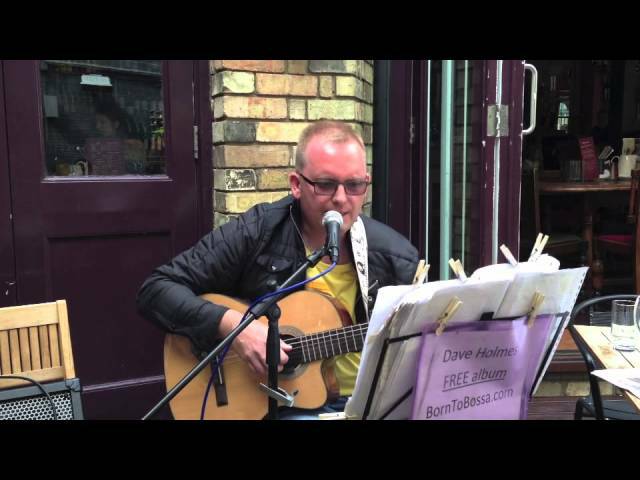 I have been playing solo gigs for a couple of years now, in UK and mainland Europe. I released two albums in 2014 which are FREE (BornToBossa.com) and tracks from those albums have been played on FM Radio stations and downloaded all over the world, along with live performances by myself on UK and Dutch Radio. So if you love Brazilian Bossa Nova and MPB, along with other popular globally renowned tunes and original songwriting, register here and Follow me now, set up your email notifications, and come join me for one of my shows! Oi gente, estou fazendo shows da Bossa Nova online aqui, ao vivo direto do meu estúdio pequeno em casa na inglaterra, o cronômetro regressivo mostra a hora do show! Como funciona? Pra ver/ouvir, vcs tem que cadastre aqui no ConcertWindow.com Depois de fazer isto o preço do 'ingresso' é "Paga o Quanto Quer". e vc assiste tudo online Valeu! e Eu te vejo aqui logo!